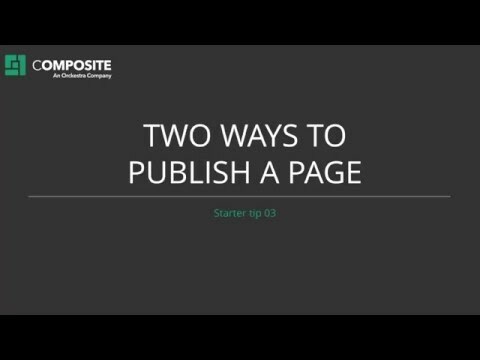 When you have created a page and feel satisfied with its content, you can publish the page to the website. On the Content tab in the page tree, select the page you want to publish. Alternatively, you can right-click the page and click "Publish" in the context menu. If you click "Send For Publication", the page will be published after it is approved by the user with this permission. Select the page you want to unpublish in the page tree. The toolbar will now display a new menu command called Unpublish. Click Unpublish and the page will no longer be displayed on the website. You can also unpublish the page from its context menu. When you are editing a page, you can also publish it. Rather than saving the page by clicking the Save button, you can switch the mode of the button and click Save and Publish instead. and then publish the page with these changes.